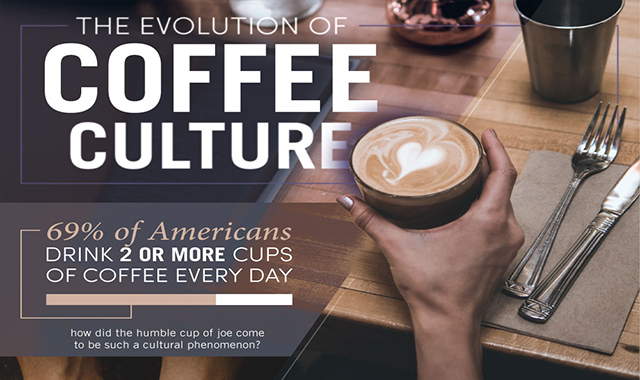 The evolution of coffee culture #infographic ~ Visualistan '+g+"
Today, 69% of Americans drink more than two cups of coffee a day, in fact, you may even be drinking one right now. Though one of the most popular drinks in the world, it is subtly, yet wet understood, that coffee is more than just a beverage. Influencing culture, tastes, and even politics wherever it goes, coffee’s place in history is alongside some of the most memorable cultural shifts from burgeoning global trade of the 17th century, to anti-imperialism, to our favorite TV sitcoms. So what is it about coffee, aside from being so satisfyingly delicious, that influences us? It starts with looking to the past and understanding how it all began. If coffee could talk, it would have a big story to tell. Take a look at this infographic for more on the history of coffee, how it has influenced our culture, vice versa, and what it could mean for the future in our rapidly evolving world.